There’s something new along S. Lamar, and for once it doesn’t involve condos or cappuccino. For the past couple months, South Austin Music has been adding a mural of Austin musicians to their exterior, and the work appears to be nearly complete. The mural is the creation of local artist Aaron Sacco, who also worked as an animator on Richard Linklater’s roto-dystopian film, A Scanner Darkly. How you can create such likenesses on brick is beyond me, but I guess that’s why Aaron paints and I go clickety-click on a computer (sometimes). You can discover the mural’s history and track Aaron’s progress at his Austin Artist blog, which also features some of his other freelance work. There are 30 musicians faithfully portrayed at 1412 S. Lamar. Those of you with access to a time machine can retrogressively win a free t-shirt by naming them all, but everyone else can play along in person to the accompaniment of dulcet rumblings from the neighboring South Austin Speed Shop. I love seeing a new mural along S. Lamar to complement Martinez Brothers Taxidermy. This has me motivated to check out other popular Austin murals more closely than the usual drive-by appreciation. 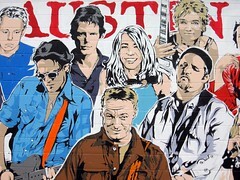 The “Welcome to Austin” mural on S. 1st is a given, but what are some of your favorites? We took our save-the-date photo by the Greetings from Austin mural on S. 1st and we look just like a postcard. Perfect for our save-the-date postcards! Kinda unoriginal of us, but a lot of fun.